From the moving statue of King Billy to a big, a very big, house outside Mullingar in County Westmeath. This large building with extensions looks like yet another country house converted into a convent or school. Am I right? Morning Mary I have to tell you you are wrong! Within minutes Niall McAuley told us that the house is currently a private dwelling. Messers French and Lawrence are also incorrect with their spelling, it is in fact Clonhugh not Clonugh as on the face of the photograph. Lord Greville, I am sorry to learn, was bitten the other day by a dog at Clonhugh, his lordship's seat in County Westmeath. We are presuming that he visited the one and only Louis Pasteur who discovered pasteurisation and also developed a vaccination for anthrax and rabies, again we are presuming the rabies jabs were the object of the dash to Paris by Lord Greville. Clonhugh House, I think (25" link). Per the NIAH: Detached five-bay two-storey Italianate country house, built in 1867, with projecting single-bay pedimented breakfront and projecting Ionic entrance porch to centre. Various two-storey extensions to the northwest. Now in use as a private dwelling. One Mr. E.W. Hope-Johnstone MFH commissioned a number of Poole shots in the archive, sadly not digitized yet. [https://www.flickr.com/photos/gnmcauley] A 1948 aerial view for confirmation. The 1901 census says it belonged to Lord Greville, but only staff in residence. [https://www.flickr.com/photos/scorbet] The greenhouse in that 1948 shot is on the 25" but not here, so we are before the 25" survey of 1911. When the NIAH says "Various two-storey extensions to the northwest", I think it has things reversed. Flipping from the 1830s 6" to the 1911 25", we can see that those structures are older than the main house, belonging to the yard of the earlier house here. More people here in 1911, but still no Lord Greville. The house looks pretty new here, but there is an 8ft tall creeper at right, so I'd guess we are in the 1870s. Westmeath County Library also has a copy of this photo. It was bought by the Harvey-Kelly family in 1927. Lord Greville, I am sorry to learn, was bitten the other day by a dog at Clonhugh, his lordship's seat in County Westmeath. The popular peer left Ireland immediately, and travelled "right away" to Paris, there to place himself under the care of M. Pasteur. By this time I hope he is completely cured. But the dog which had bitten him was "subsequently killed". Did the animal exhibit symptoms of rabies or was it only slain through credence in the very ancient superstition, the principle of which is embodied in the French proverb, "Morte la bête, mort le venin"? More press cuttings - 1887 - Greville supports Home Rule - trove.nla.gov.au/newspaper/article/169705032?searchTerm=c... 1910 - His will - trove.nla.gov.au/newspaper/article/5240592?searchTerm=clo... 1911 - Coronation celebrations - trove.nla.gov.au/newspaper/article/111094258?searchTerm=c... "On the invitation of Lord Greville, a large company was sumptuously entertained at Clonhugh, Co. Westmeath, in honour of the Coronation [of George V], and a tar-barrel bonfire, was lighted on the Kilpatrick Hill." 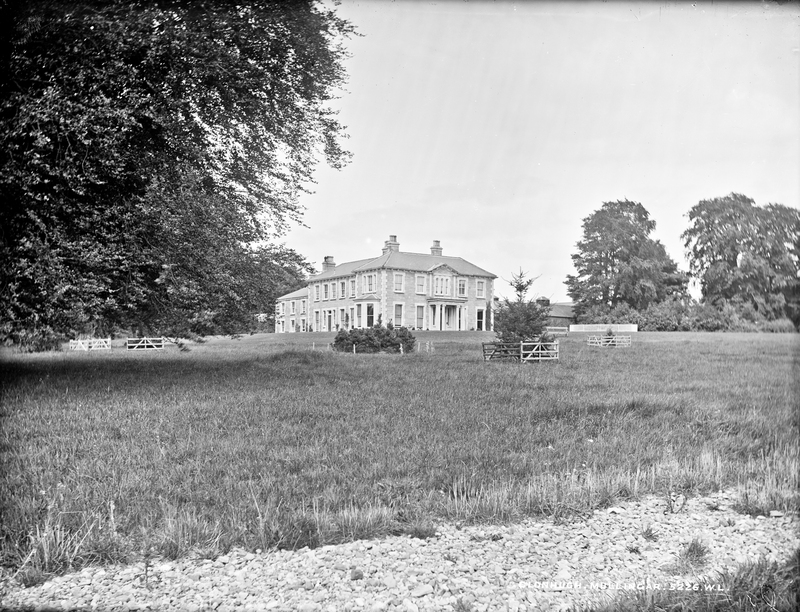 The house was built for Fulke Southwell Greville-Nugent, later 1st Baron Greville of Clonyn. The Lord Greville referenced in the census is his son Algernon William Fulke Greville, 2nd Baron Greville, born 1841, and "Lord Greville" from 1883 to 1908. [https://www.flickr.com/photos/gnmcauley] [https://www.flickr.com/photos/scorbet] [https://www.flickr.com/photos/beachcomberaustralia] [https://www.flickr.com/photos/[email protected]] Thanks for all the work today, much appreciated.